You’ve probably picked your favorite cocktail and dessert recipes for Valentine’s Day, but once you make them, there’s still plenty to do! Why serve them in a boring tray when there are so many styling options you can try? Give your yummy creations a sweet aesthetic of their own. Zahira of Eventus By Zahira is here to offer some great styling tips for your food and drinks. How cute are these clipped love notes? Write a little message and attach them to your sweetheart’s glass to let them know how you feel. Of course, the notes aren’t only reserved for that special someone! Add some sparkle to all the clothespins you have and spread the love to everyone at your party. Garnish the tray with bright red pomegranate seeds to match your cocktails. 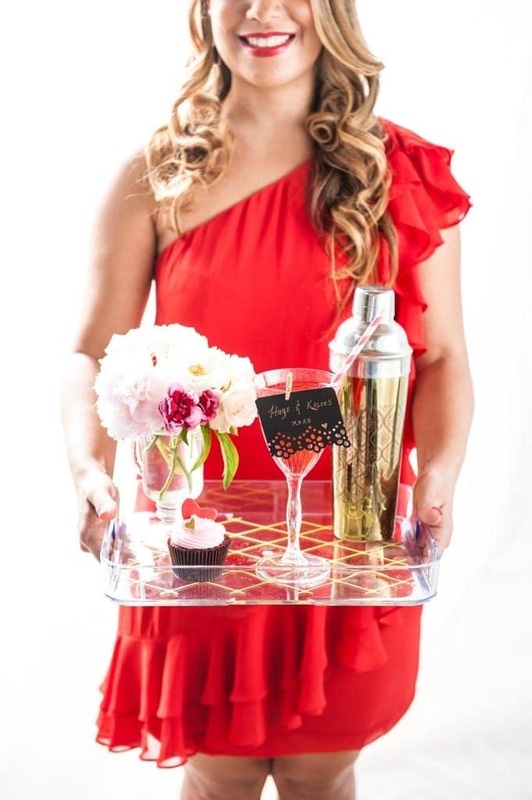 Arrange your cocktails with some sweets (like POM Velvet Cupcakes) in a clear, gold-lined tray to add a classy touch without looking overwhelming. A small flower bouquet completes the look! Cheers to a lovely and perfectly styled holiday!